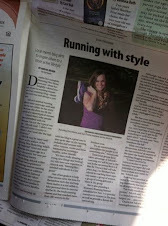 I have been following Deanna's journey from Miles to Run for sometime now. She's another Wisconsin runner/blogger and we've yet to connect at a local race .... but will someday SOON!!! (Right, Deanna?!?!) 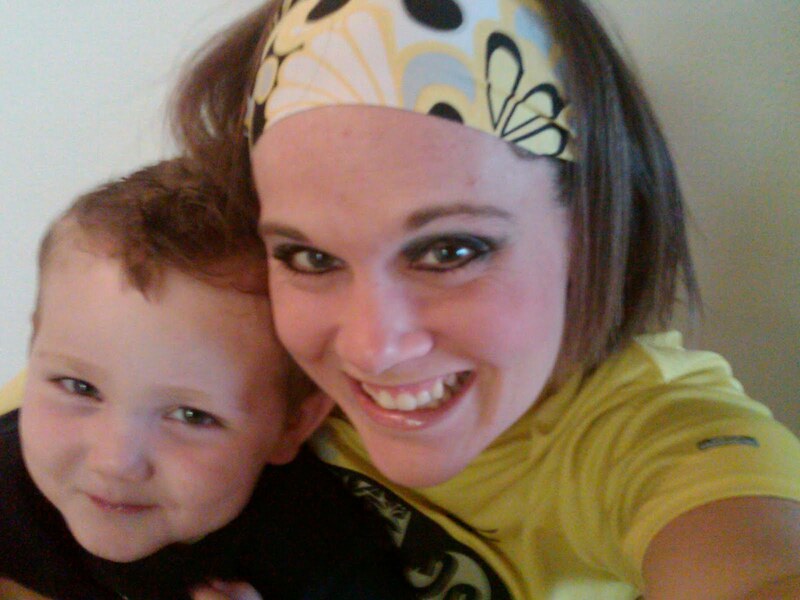 She's a fellow treadmill runner and we can totally relate to the tough Wisconsin winters!! 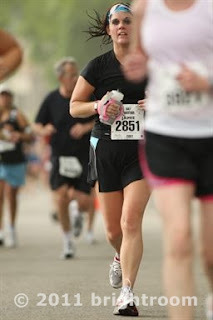 She also LOVES the half marathon distance and handheld water bottles ... surely a gal after my heart!! 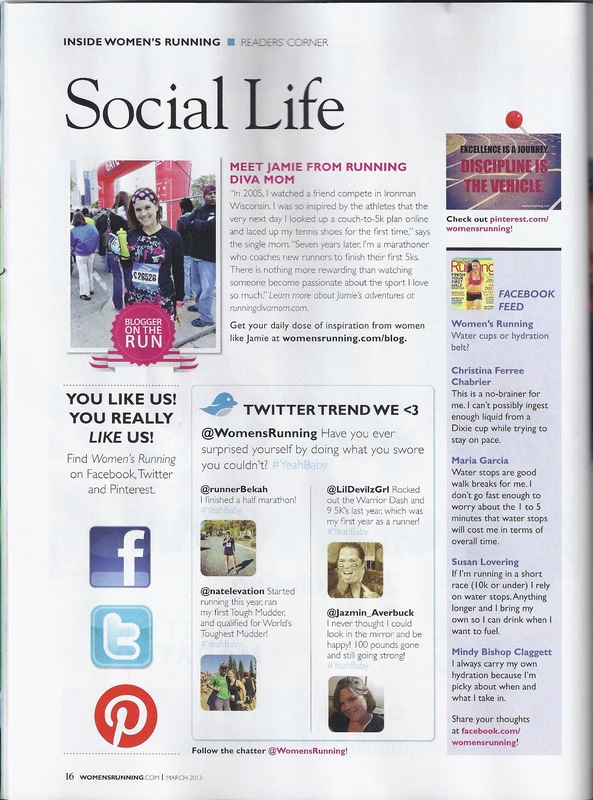 How long have you been following Running Diva Mom, and why do you read? I have been following RDM for quite a while. 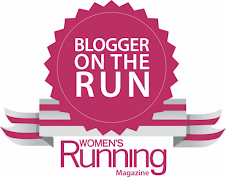 Jamie's blog is one of the first ones I started following when I first discovered the world of running blogs (I can't believe I didn't know about the blog world sooner!). 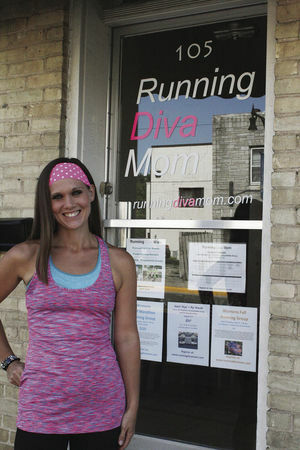 I was searching online for other runners in Wisconsin and came across her blog. I have been a faithful follower for many reasons. Jamie and I both live in WI so we can relate to our ever-changing weather and many snowstorms, and we both have children. 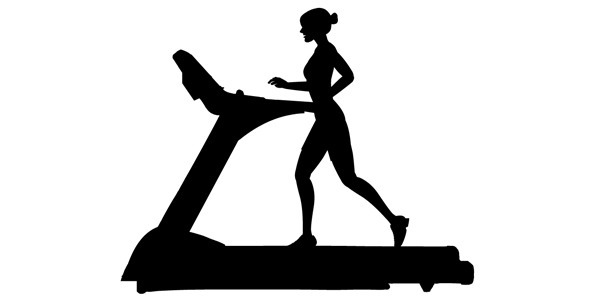 With those two combinations alone, the treadmill is a major piece of our training equipment. I also like Jamie's blog because she is "real." She has good runs and bad runs and isn't afraid to be honest about them. In many ways she is doing exactly what a lot of us are doing...staying fit, staying sane, raising kids, and trying to balance it all. 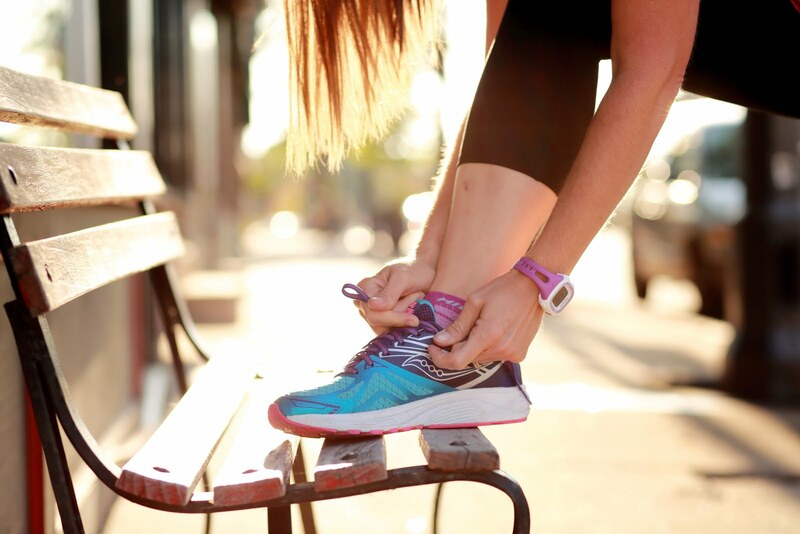 How many miles do you run on the average month? I would say I average about 70-80 miles. Running is my favorite form of exercise, but running alone doesn't work for me. If I incorporate high intensity intervals like Tabata, and/or strength moves like body weight exercises, I see the most results from my body. I also like to limit my workout time to an hour if my kids are home. Weekends are for my long runs where time isn't a factor. But...next fall I will have all three of my kids in school...oh, just think of the many hours of running I could do then?! 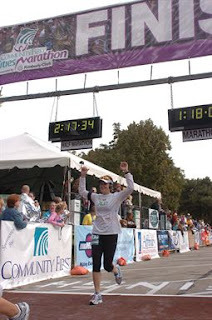 Favorite distance: My favorite race distance is the half marathon. I have run 5 to date. It's a nice distance because it doesn't take a ton of time to train for, yet it's challenging enough that by the last 3 miles I just want to be done. When you think about it, 13.1 miles is a long way to run. 5K's are way too fast for me and I end up having a lot of negative self-talk as people are passing me. I am just not built for speed; but I still run them from time to time. I like 10K's as training runs for a half marathons, but there aren't too many 10K's offered in my area. I have never run a full marathon and I do not have any desire to run one. I don't know if that will ever change, but once my long runs get close to 2 hours I get burnt out. I can't imagine doing 15-22 mile long runs. Ugh. Overall, I love racing because of the energy you feel from being in crowds of like-minded men and women all passionate about running. 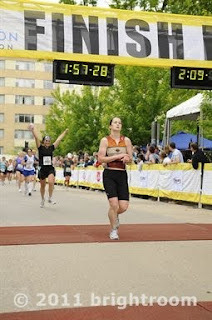 Oh, and the feeling of crossing the finish line! As far as other gear, I started running in 2008 and I still consider myself "new" to running. I am constantly finding new items to help me when I am running outside. 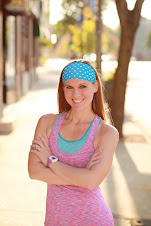 Who would have thought that sunglasses with a rubber nose piece would be one of the most life-changing things in my running?! I also experimented with carrying water and learned that I did not like carrying water around my waist. I landed on the Nathan Sprint handheld water bottle. Before my water bottle, I planned all my runs around the city parks where there were water fountains. 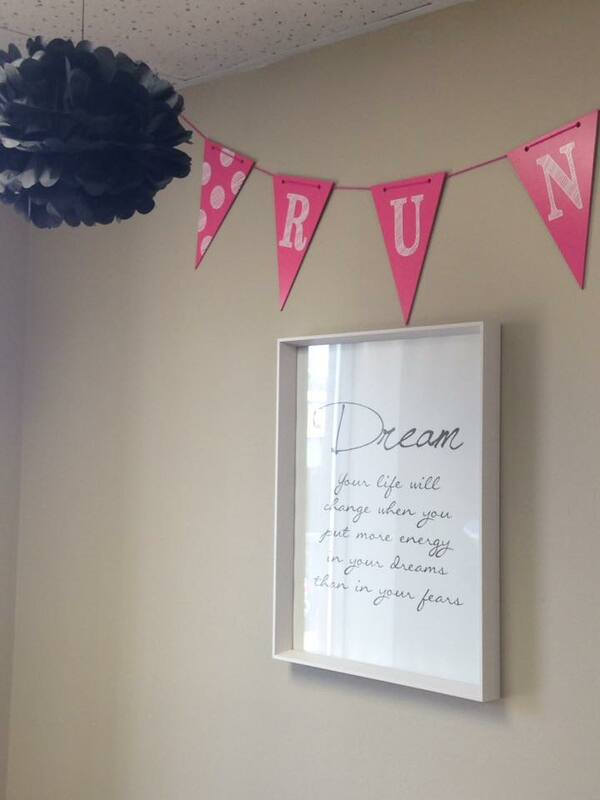 The Nathan Sprint paved the way for all new running routes. 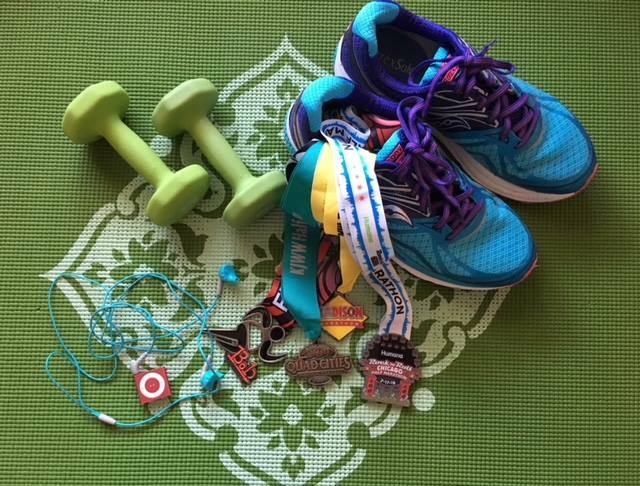 What is your favorite running memory? By far, my favorite running memories are the ones when I'm running with my friend Sarah. She and I have been friends since 1st grade, and when we get together we have the best time. 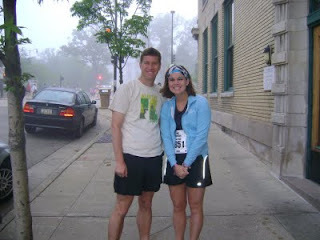 I was lucky enough to run with her for her first half marathon in 2009. I was so proud of her. It was so nice to have someone right alongside me the entire race and cross the finish line together. 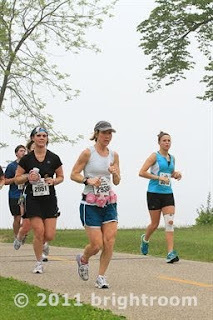 And even better is when we relive the experience and can laugh about how tough the last three miles were. My "not so favorite" running memory was during one of my dreaded 5K races. It was summer, and hot. I started out way too fast and by the end I was dying. I gave everything I had and resorted to a run/walk to the end. There was no "method" to my madness, I just ran when I could and then walked until I could run again. Anyway, at one point an older woman (fellow runner) ran up to me and said in a very concerned voice, "Are you OK?" Ugh. 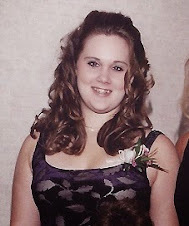 Did I really look as bad as I felt?! I'm not proud of it by any means, but that terrible race gave me my 5K PR. Did I mention I do not like this distance? Post run indulgence: I love to eat. I know a lot of people say that, but I honestly do. And I love to eat pizza...lots of it. I don't even know what "in moderation" means when it comes to pizza. So when I run a long run, later that night you know we are going to be ordering pizzas. Advice for the new runners out there: My advice would be to reward yourself. Each week, when you hit a new milestone, reward yourself. When I first started running, this was such a motivation for me. When I finally hit 3 miles of running non-stop I treated myself to a pedicure. Even promising yourself that if you get this long run done you can spend the rest of the day camped out on the couch in sweats is a reward worth running for. The idea is that the children log their miles (in quarter mile increments) and their reading time (in quarter hour increments) thrroughout the summer in the Reading and Running Log (HERE). Do you know how long a marathon is? It is 26.2 miles. Can you run a marathon? YES! Can you read 26 books or read for 26 hours over the summer? YES! All children, 8th grade & under, are invited to participate. Join kids from all around and challenge yourself to finish the WELS Kids Marathon. You will run 25.2 miles over the summer and read 26 books or read for 26 hours, which will improve both your body and your mind. You may run or walk the 25.2 miles in ¼, ½ or 1 mile increments, and read in ¼, ½, 1 hour or per-book increments. By entering, you will receive a Log Sheet to help you keep track or your running and reading. By finishing, you will not only be considered a marathoner for life, but will also receive a WELS Kids Marathon T-shirt, finisher’s medal, and goody bag. Then, join us from 6:00 P.M. – 8:00 P.M. on Saturday, August 27th to run the FINAL MILE of your marathon and cross the finish line a WINNER! There will be music, food, festivities, and giveaways at the Final Mile event, which will be at the Wisconsin Lutheran College’s Raabe Stadium (10200 W. Watertown Plank Road Wauwatosa, Wisconsin – behind Milwaukee Sheriff Headquarters). The cost is only $12 per kid, thanks to a generous gift from Thrivent Financial for Lutherans. Also thanks to Skyhigh Marketing, Wisconsin Lutheran College, and Mike Evans Design for their support. A portion of each entry will be donated to a local charity! Though we cannot attend the final event, I look forward to having Little Diva keep up with her reading and running adventures all summer long. 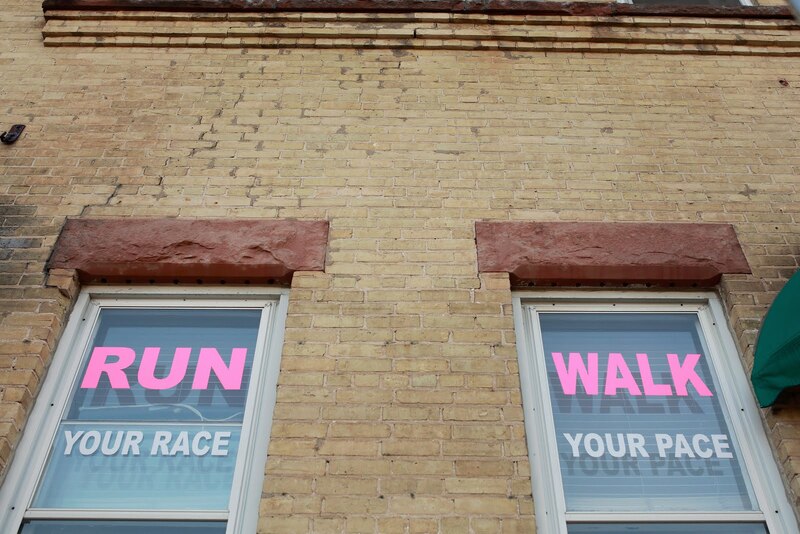 You don't need to be able to attend the final mile in Milwaukee to participate. Tonight was one beautiful Tuesday evening! After four days of treadmill running with the kids, I was sadly kid-free this evening. With no one to come home to, and a looong holiday weekend ahead of me without the kids ... I decided to put off my chores and errands for the evening and head out for a long-ish run tonight. I did my new 10K route around my neighborhood and the surrounding area. I was feeing great, the weather was PERFECT, and I knew I had about 15 miles I needed to fit in the next three days, in order to reach my 100 mile goal for the moonth. So, I kept going. I decided I was gonna run half marathon #8 for the year! Yeah .... just like that! It's so awesome just being able to do that spontaneously. I remember when I use to have to TRAIN for this stuff! I then headed towards my old neighorhood and did my old 10K route (which is much hillier than the new one). It brought back fond memories of my former life, and my late-night 9 pm outdoor runs in the evening after the kids were in bed, or my 4 am runs when my X was training for Ironman two years ago. There is no longer a need for such runs since I am on my own so often and the only time I do late-night runs now are after the kids are in bed, and then I'm forced to put in miles on the treadmill. I returned home, the dishwasher was full (surprising no one emptied it for me), toys were still scattered over the living room from my fun weekend with the munchkins, and it was 9:30 and I still hadn't put my work things away or gotten ready for the next day. But, I didn't care. I took some quiet time (alone) for myself ... on the pavement ... alone with my thoughts ... and got 13.1 miles in, in the process! In my new place, we have been settled for awhile, but there have been a lot of empty picture frames decorating my new walls. I had removed the family photos from the frames and was waiting to replacing them with something fresh and new. Two years ago, my family had a fabulous photo session with Kendra Stoltz Photography (HERE). The family photo session took place in her outdoor studio at her home. It was effortless, carefree and stress-free. I had done so many photo sessions with the kids before (taking each of them every month of their first year) to local indoor studios and the sessions were always stressfull, I was sweating, the kids were crying and we were telling them to constantly sit still or smile at the camera. With Kendra, nothing was posed, everything was natural, everything was us. And, each of our personalities came through in the photos that Kendra captured two years ago. I was sad to take down many of those photos as I transitioned into the next chapter of my life. But, my gift to myself during this transition was to have Kendra capture my new family of three in photos ... and to fill those picture frames. We ended up visiting a local park and Kendra snapped a few dozen photos of us over a half hour. The kids and I played, chatted and tickled eachother. Again, I was not disappointed with the beautiful photos that will be decorating my walls. I can hear Little Dude's giggles and I can see Little Diva's sassy personality shine through in every photo. Thank you, Kendra, for helping my new house feel like a home and being surrounded by family photos once again! I have sent several friends and neighbors to Kendra and no one has been disappointed with the images she captured of their families. If you are in the Madison, Wisconsin area, book your session now. She has several different options available for every budget. Life has been full of changes lately. Mostly good. Lots of positive things happening in my life. Newly single. New place to live. New neighbors. New relationships. New routines. New opportunities. The constants in my life have been .... my kids. my career. my running. An assortment of cards that were mailed to me, left on my desk at the office or presented to me at the celebration of my new beginning over the past six months are so comforting. I keep them visible as a constant reminder that there are people that care about me ... even when I am alone, without the kids. One of my favorites is the one that talks about how happiness is a journey. Not a destination. It reminds me that as I continue to think positive and am much happier than I once was ...... True happiness will not happen for awhile. Just as my running is a journey from one milestone to another .... true happiness will happen in increments along the way. One positive experience will lead to another. One opportunity will bring many others. I think that I believed that once I started my new life that that questions would be answered and my "forever" was going to begin. I'm not going to find my new life overnight and it's the experienes, decisions and obstacles that I encounter along the way that are going to help me learn and grow. Again, just like my running. I don't need immediate answers right now, regarding what my future holds. But I do know that the kids and I will be happy. Life has been busy between being a single parent half of the time, working 10-12 hours at the office, coaching 2-3 sessions in the evenings, juggling friends, family and relationships, training & racing, and doing the day-to-day household responsiblities & errands alone .... but, all of these things are blessings in my life. And, I can't imagine my life without every element of my life. And I'm juggling it all on my own ... or at least trying. I'm finally realizing that I also need time for ME. I'm running, running, running (for exercise AND just to get from one element to the next) and I just need to slow down and perhaps even SCHEDULE some time for myself. So, I decided to set aside a day next month to use some gift cards that have been sitting in my purse : as I will be going to the spa next month, going shopping for some new clothes and may even enjoy a meal by myself at one of my favorite restaurants. Who knows. 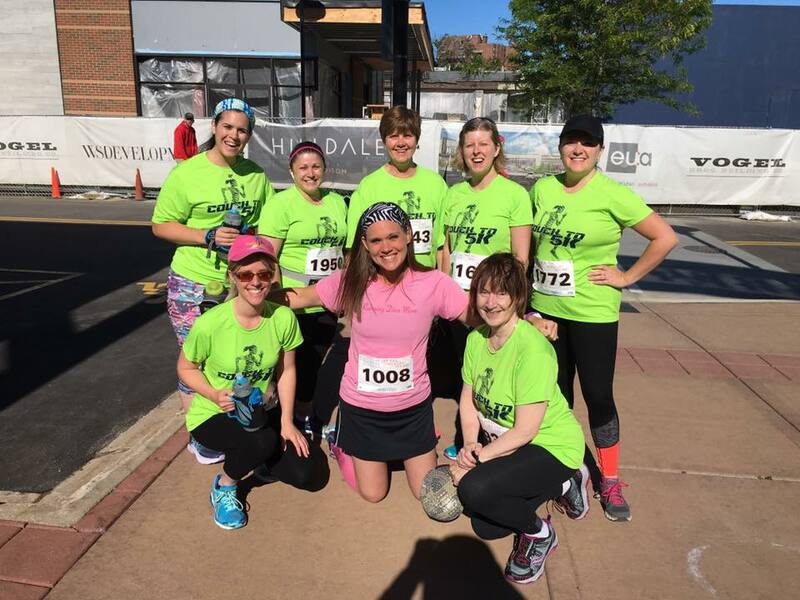 I was so excited this spring, when the Fort Atkinson Half Marathon (HERE) agreed to sponsor me for my June half marathon this year. This was supposed to be my 6th half marathon of the the year, but ended up being my 7th! The night before the race, I went out to my very first beer tent EVER. Probably not the smartest idea ever. I had one drink with some friends, had fun people watching and headed out around 10:30. I had my clothes laid out for the race already and tried to head to sleep. I got about 5.5 hours of sleep when the alarm went off at 5 am on Saturday morning. I got dressed, applied my makeup (shocker!) and downed a greek yogurt, banana and Refuel energy bar. I downed a bottle of water and a Diet Mountain Dew during my solo 45 minute drive to Fort Atkinson. Packet pick up was located near the start line at a neighborhood school. I parked easily on a side street around 6:15 and the race started at 7:00. I went to pick up my packet and there were about a dozen people doing the same. Packet pick up was easy, the race was chip timed, but they ran out of several sizes of the technical tops (said they would mail me my medium). I used a porta-potty (only sole in line) and headed back to the Marathon Mommy Minivan to affix my timing chip and race bib. Margaret (HERE) and I at the start line (apparently a little bit shocked that there were cameras at the start line?!?!). The first few miles we were heading through residential neighborhoods. A lot of the families were out spectating and several were hosing us off with sprinklers. Then the country hills started ..... one after another ... until mile 7. I don't know exactly how many gigantic hills there were (about ten?) ... because honestly ... I lost count. It was insane! I could not believe it and was NOT prepared (nor were my legs). It was pretty much country roads and there were quite a few spectators out that I saw a few times, so it must have been easy enough to cheer people on. I took lemon-lime Gatorade at every aid station and used my handheld water bottle during the entire race. It was warm, humid and the sun was shining down hard on me. I could feel my face getting red. Around every corner there were well marked signs (along with the volunteers) that told us where to go and even said if there was water up ahead. It was really helpful. We headed into town and through the downtown area, including the farmer's market. I was feeling better after the ridiculous hills were behind me. We headed out through an industrial area and one last gigantic hill, past the cemetery and then finished out on a running path towards the finish line. I knew I didn't PR and not every day is going to be a PR. I would have been ecstatic with my time last fall, before I had my awesome PR just three weeks ago in Madison. 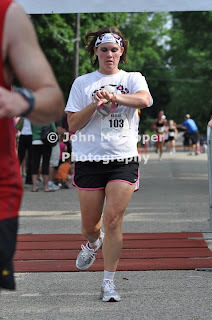 But, I ended up crossing the finish line in 1:56:43 and was comfortable (but not exactly happy) with it. I stopped my watch, received my sweet medal and grabbed an orange slice and a bottle of water. I believe they also had chocolate milk, bagels and bananas. I found Margaret and her pink shirt in the crowd with her family. She had taken off in front of at the start of the race and I believe was hoping to run 1:48-1:52. She ended up running 1:55 and some change and complained about the hills, too. 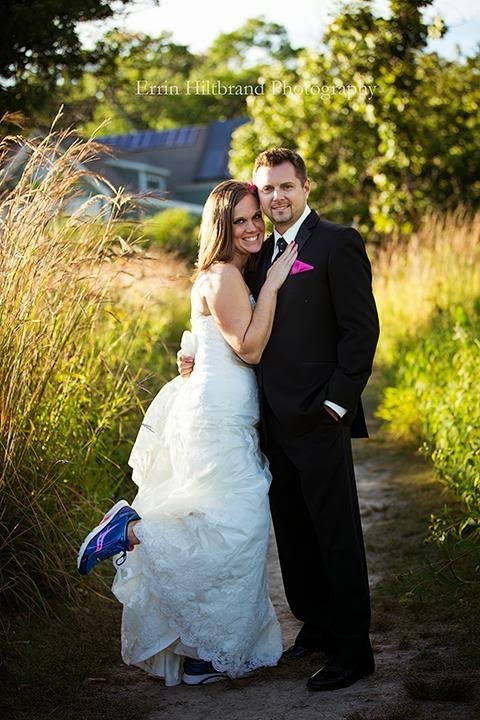 Her husband snapped a FEW quick photos of us before I headed home to shower and pick up Little Diva and Little Dude. included a cinche bag, water bottle and other goodies. 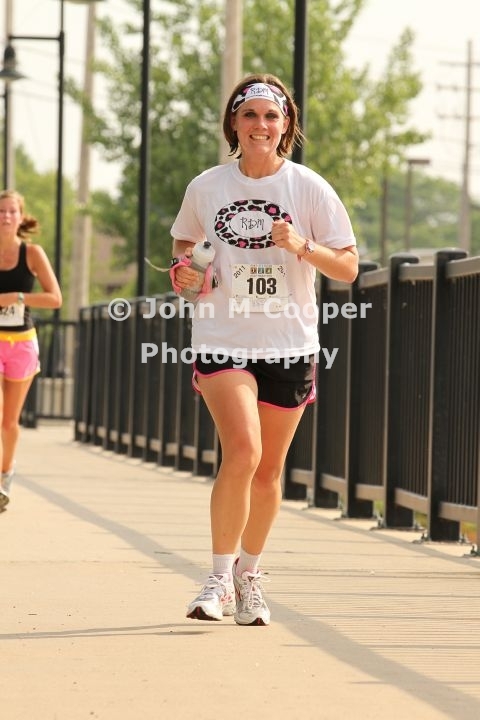 On Sunday, May 29 I ran my 6th half marathon of the year. It was supposed to be #5, but I snuck in two in May. 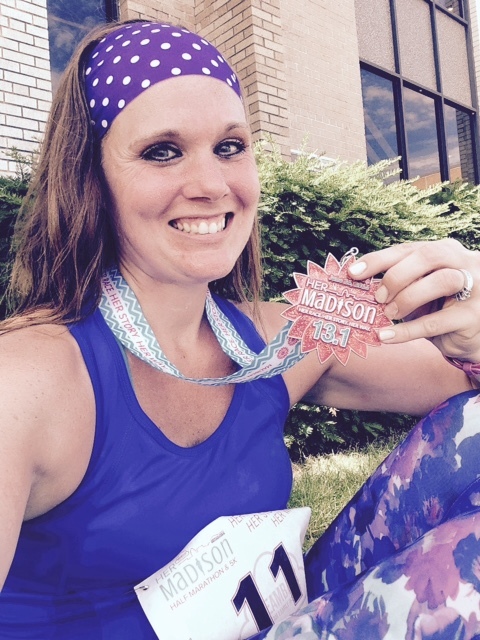 Over Memorial Day weekend, I ran the Madison Half Marathon (HERE). On Saturday I coached a client near the Madison Monona Terrace and headed over to the convention center (a new location this year) and paid to park and headed in. I visited briefly with another runner from my office as I picked up my packet. There were no lines and packet pick up went smoothly. It was very well organized this year. Packet pick up, shirt pick up and the expo were all in separate rooms. I also picked up packets for a blogger and his friend so that they didn't have to stay over night. in Madison. The technical shirts were fitted for women and we were given a nice cinch bag for our things. The expo was a decent size. I passed up the Bondi Band booth (surprised?!) and found a new running store in town, called Catalyst (HERE). I talked briefly with the co-owner, whose husband is a UW coach. 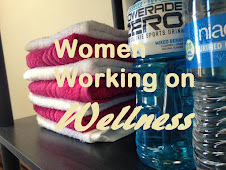 The store sounds super cute and is geared towards active women. I can't wait to stop out to Atwood Ave. I picked up a new running skirt and matching top from the Catalyst booth for the race. I took some Tylenol PM the night before and fell asleep shortly after 8:00 PM. Yes, believe it! I wanted to rest up … and I certainly did. My alarm went off around 5:00 AM on Sunday morning and I had the outfit I purchased at the expo the day prior all laid out and got dressed … and yes, applied my makeup! I know you shouldn’t try out new running gear the day of, but I tried on my ensemble the night before and it was comfy … and cute. Again, I wouldn’t recommend trying something new the day of the race (and should know better), but I fueled up with a Accel Recover bar (HERE), a banana and a Chobani yogurt. The bar was super yummy, filling and satisfying. Consistency was similar to a tootsie roll. I didn’t have trouble chewing it pre-race, like I do with some other energy bars. Before I left the house, I received a phone call from Bill from Love to Run (HERE). He and his buddy were already at the race and got prime parking (FOR FREE) near the start of the race. I left the house and arrived with plenty of free parking available on the street. We soon connected and caught up a bit and took some photos with the Capital in the background. It was so foggy that morning that you couldn't even see the beautiful building behind us. Bill and his friend are constantly running marathons and they were both running the full marathon that morning. And didn't seem nervous at all. The full marathon started at 7 am. The half marathon started about ten minutes after that. I got in line with the other half marathoners, the back of the pack, and downed an Accel Gel in vanilla (HERE). After the race started, it took me about five-six minutes to get to the start line. As the sea of runners morphed towards the start line, somehow I ended up at the VERY BACK of the entire race field. Some of us laughed about it and how we were just going to be passing everyone for the rest of the race. We circled half-way around the Capital Square and down West Washington Avenue. There were some barricades set up and everyone was complaining about how cramped it was. People were basically jogging in place as we tried to get through. This was very annoying, as you typically try to escape the crowds at the start of a race. We headed near the Kohl Center and then back towards State Street. The route would’ve been nice had we actually headed down State Street, but instead we just crossed the intersection. We headed east towards Tenney Park with some rolling hills. There was a lot of crowd support along much of the first few miles. And, I saw a lot of cheering sections several times, so there must have been a great opportunity to be on the move and find your runner at the next location. I ran the first 5K in about 26 minutes. My PR was 1:54 and some change. I wasn’t sure if I was going to set a PR today …. But, I felt phenomenal and strong. I spotted an old friend who was spectating on his bike. Some of the college kids were handing out beers on the street. We headed down Sherman Avenue and towards Maple Bluff. I spotted another friend from work that called out my name. That made me smile and gave me a huge boost. We passed the Governor’s Mansion and headed back towards Tenney Park. The air was humid and the sun was shining. And …. I dressed all in black. The new running outfit was still comfortable and causing me no problems. Due to the humidity, I continued to drink water from my handheld water bottle and picked up cups of water at the aid stations and dumped them over the back of my head. I was well overdue for a haircut, since my hairdresser was on maternity leave. My wet mop was flopping all around the second half of the race and I realized just how badly I needed to visit the salon. I saw my friend from work (who was also spectating for his brother) about 5 more times along the course. Afterwards, he said that it was a great race to spectate by bike. We laughed every time we saw each other … I was like “Oh, you again?!?”. It was nice to have someone out there cheering for me, since the kids were with their dad Memorial Day weekend. There were several aid stations with water, several that also had Gatorade (lemon-lime – not my favorite at all, but I took a couple), and quite a few with energy gels (several flavors). I downed two gels the second half of the race. One station had jugs of water but no cups. I don’t think they ran out of cups, but am not sure why they were just pouring water into peoples’ hands?! Crowd support was great through Tenney Park and along the path, as we headed back towards the Monona Terrace/downtown area. We ran through a shaded residential neighborhood and up some slight inclines. I was still feeling awesome. We passed Machinery Row, then Monona Terrace, headed along Lake Monona and then a residential neighborhood on Willow Island and around the Bay. The sun was beating down, but I was reminded just how difficult this race was the year prior at this point. I had run the full marathon and the course was “closed” and the clock was stopped due to the extreme heat. This was a piece of cake. I saw my friend from work again around mile 12 and yelled to him and his wife “PR, Baby!!!”. I was going to crush my PR!!! We headed up the loooong (what felt long!) hill up West Washington Avenue and towards the Capital. Several runners were walking up the hill. I was starting to feel sluggish, but kept going. Crowd support was awesome, as I recognized two cute little blondies calling my name. They were my old neighbors, who were cheering on their mom. 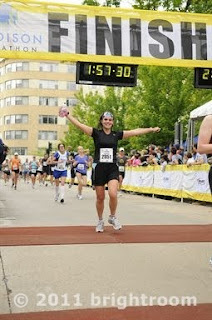 I smiled and waved and circled in towards the finish line in the Capital Square. 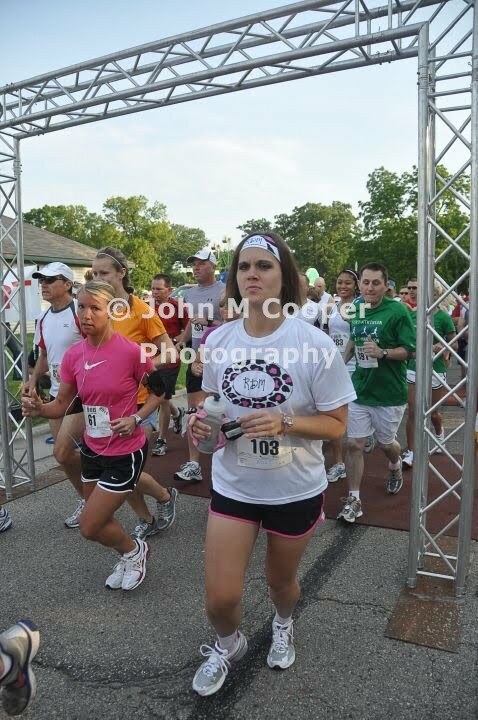 As I approached the finish line, I didn’t even look down at my watch, I knew I rocked the race!! I felt so great in fact, that I raised my hands (and handheld water bottle!) 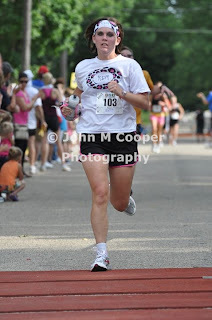 in the air and the crowd cheered even loader as I crossed the finish line. I smiled and stopped my watch to see: 1:51:56. A crazy PR by 3 minutes!!! I gathered some cookies for the neighbor girls and a chocolate milk and water for myself. I stood in the short line to get my photo taken (above) and the photographer gave me a huge thumb’s up as he said, “Cute!”. I headed over to meet up with my neighbors, to help them cheer their mom to the end. While standing there, I saw quite a few of you that I’ve met through my blog (but are non-bloggers) coming in to finish your own half marathon!! Toby and Roberta finished their very first half marathon – congrats! 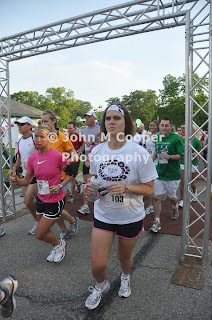 And, I recognized Miss Tara’s face (who I also had to double check the name on her race bib!) who was closing in on the finish line, too. I enjoyed cheering for them all and giving them high fives. Also, congratulations to Doc Shobhi who finished her first half marathon. Several told me after that they were feeling really terrible at that point and needed the boost. We then saw my neighbor, Kelly come in to finish her half marathon. My friend, Dwight, and a guy I met through my blog, Jason, both paced the 4:00 full marathon pace group and did a great job seeing everyone through to the end .... right on time. 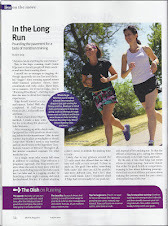 They both said that pacing was extremely rewarding for both of them. I hope to try it sometime. Congratulations to everyone that participated!! I have heard that everyone had a very positive experience this year. I then dropped some items off at the Marathon Mommy Minivan and grabbed a sweatshirt, since I was starting to get chilly. 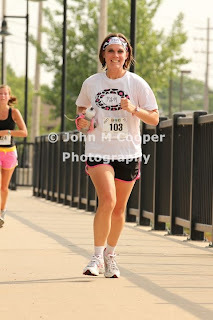 I grabbed my camera and headed past the finish line to try to meet Magic 98’s radio personality, Lanette Hansen. 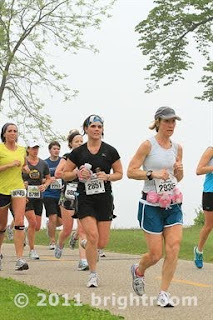 Lanette manages a healthy living blog (HERE) through the radio station and runs marathons and competes in triathlons. 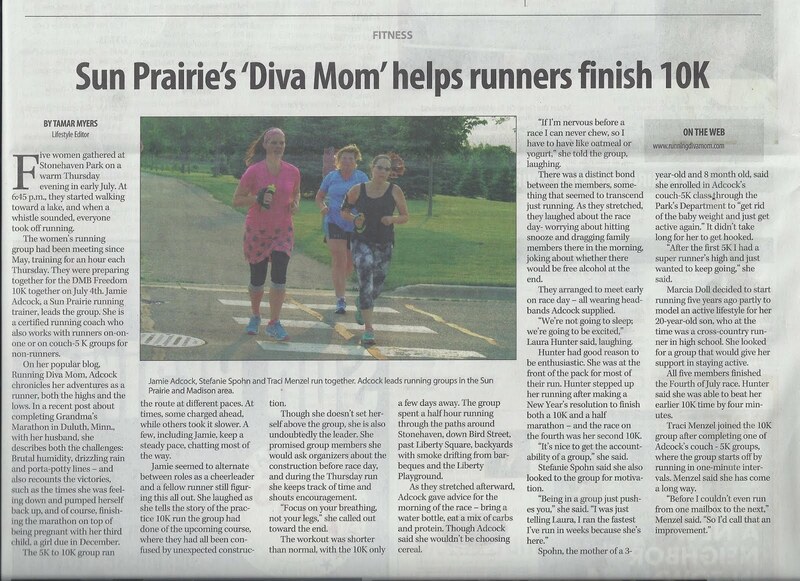 She was my generous sponsor for this race and is a phenomenal woman. Her husband took our photo and I thanked her about fifty million times. I then headed home for a nice, warm shower …. and a good haircut (finally!). I was recently given the opportunity to review the Go Hat from Headsweats. You can read all about my fabulous experience HERE. Please visit Head Sweats online HERE and start shopping. There were 91 entries in my recent giveaway. One winner was chose at random to receive a Go Hat from Head Sweats. I was recently given the opportunity to review a variety of socks and insoles from Sof Sole. You can read all about my fabulous experience HERE. Please visit Sof Sole online HERE and start shopping. There were 102 entries in my recent giveaway. One winner was chose at random to receive a Sof Sole Prize Package. I was recently given the opportunity to review Ironman Yurbuds. You can read all about my fabulous experience HERE. Please visit Yurbuds online HERE and start shopping. There were 232 entries in my recent giveaway. One winner was chose at random to receive a pair of Ironman Yurbuds. I was recently given the opportunity to review SW Fashion Sport Sunglasses from Sunglass Warehouse. You can read all about my fabulous experience HERE. Please visit Sunglass Warehouse online HERE and start shopping. There were 85 entries in my recent giveaway. 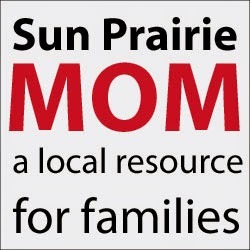 One winner was chose at random to receive a $25 gift certificate to Sunglass Warehouse. I took only 7 rest days and logged the most miles yet this year (over 130) miles and ran two half marathons. 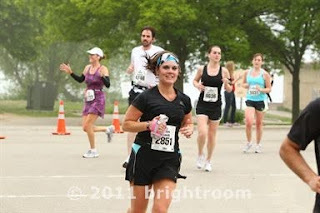 Crossing half marathon #5 and #6 of 2011 off of my list. 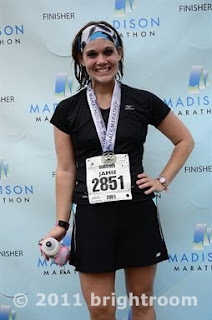 I PR'd in the half marathon by 3 minutes over Memorial Day weekend (more on that soon!)!! I ran and hiked through Devil's Lake State Park as well as Penninsula State Park. I ran on the Capital City Trail in Madison several times and am enjoying getting out of my neighborhood and doing these "destination runs". I've been blessed with my coaching through the local rec program, which has brought many more clients my way. I am thoroughly enjoying meeting other people that want to get out there and get active and accomplish fantastic new things. I've enjoyed staying in touch with other bloggers and meeting new ones out on the course. It's been great connecting with people that I already "knew" in my personal life, but didn't really take the chance to get to "know" them until we both realized we run and are training for similiar goals. I love how running can bond just about anyone and everyone. I get giddy seeing how excited people get when they talk about running and their first race experience. As excited as I am about my mileage for May. 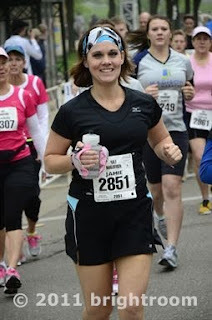 June should bring a lot more ... as I start marathon training in two short weeks!! My divorce was final in May and the kids and I are comfortable and settled in my new place. It's tough when they aren't with me, but I am surrounding myself with positive people and positive things .... my running ... and people that run with me ... are obviously a part of that. 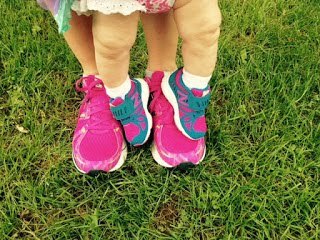 I've been planning my long runs and coaching around my time with the kids, but do need to lean on my support system from time-to-time. I'm trying to maximize the time that I have with Little Diva and Little Dude. We've been doing a lot of outings, playdates and are getting out in our new neighborhood and meeting other families. Money is really tight, but it's the little things that make them happy -- like a free bus ride to a local farm, a dollar ice cream cone at McD's, blowing bubbles with the neighbor boys and walking down to Target for an Icee. The month of May brought some warmer weather with it finally, which meant I could cross some more things off of my bucket list for this year. I visited fabulous Door County for the first time as adult, camped in a tent for three days and got out on the water on a boat. Three things that may seem so simple; but three things that I never took the time to discover before. I could say that I've ran marathons, but not that I've gone for a boat ride?!?! I'm glad that I've finally had the opportunity to do these things on my own. And, I look forward to sharing them with Little Dude and Little Diva.